In the past entry, "In lower income neighborhoods, are businesses supposed to be "community organizations" first?," I discussed the idea of businesses entering a community and having to join in a manner of speaking kinship and community networks in order to be able to participate as co-equal members of the community. Anthropologically speaking, I believe that's how people think about it in neighborhoods where social and community capital is vital to survival--which is pointed out in the discussion of "use value of place" in Urban Fortunes. But it's a foreign concept to businesses. It's not capitalism at all. Daily Round: The place of residence is a focal point for the wider routine in which one's concrete daily needs are satisfied. Informal Support Networks: Place of residence is the potential support of an information network of people who provide life-sustaining products and services. Security and Trust: A neighborhood also provides a sense of physical and psychic security that comes with a familiar and dependable environment. Identity: A neighborhood provides its residents with an important source of identity, both for themselves and for others. Neighborhoods offer a resident not only spatial demarcations but social demarcations as well. Agglomeration Benefits: A shared interest in overlapping use values (identity, security, and so on) in a single area is a useful way to define neighborhood. Ethnicity: Not infrequently, these benefits are encapsulated in a shared enthnicity... When this occurs, ethnicity serves as a summary characterization of all the overlapping benefits of neighborhood life. This comes up, albeit not just in impoverished neighborhoods, when developers and businesses are questioned about their motives and commitment to a community, based in part about whether or not they are from that particular community, and the choice of non-local firms, non-minority firms, and chain--even if cool--businesses over local independent businesses. Selective welcoming of chains as a positioning strategy for revitalizing districts. This is tricky because a mix of chains, especially certain types of chains "that are cool," and independent retailers is often mutually beneficial, because the chains can help anchor the commercial district and draw customers, which are in turn shared with the other businesses, so that the overall district benefits from increased business. But not everyone agrees that this approach is mutually beneficial, even in areas with more income. Room and Board, before. Image from Apartment Therapy. 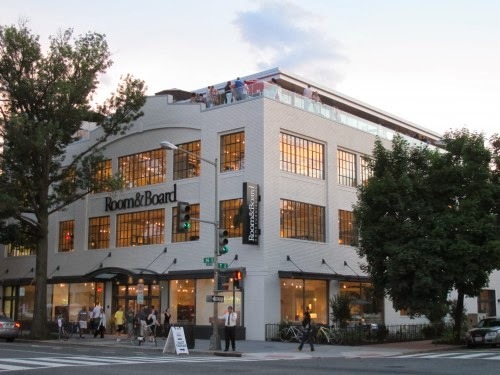 For example, local businesses on 14th Street NW argued it would be better for local businesses to use the building that became the Room & Board furniture store. I argued the opposite ("Speaking of the Room & Board store and not knowing how the retail industry works," "West Elm is closing their downtown DC store," "14th Street NW as a retail district"), because it is an anchor and it does a great amount of promotion, including to people who don't live in the immediate area, therefore bringing new audiences to the 14th and U Street district to shop and eat. Room and Board, after. Image from PopVille. Portland: Trader Joe's walks away. In Portland, Oregon, an African-American business group's agitation against a mixed use development project with housing on Alberta Street in Northeast Portland's Vanport neighborhood was expressed by multiple protests against the project over the past few months (posts here). The project involved a non-local developer and Trader Joe's as lead tenant and recently, in response to the protests, Trader Joe's withdrew, marking a likely end to the project. Left: a protest in November. From the MLK in Motion blog. 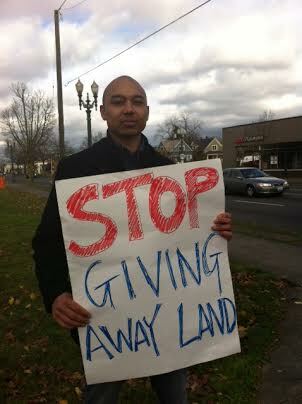 Portland's African American Leadership Forum says that they aren't opposed to Trader Joe's, but protested the project out of a belief that it is fostering gentrification, that the developer was getting the land in a sweetheart deal at a price not available to local developers, and as an example of the Portland Development Commission not working with the community. It's not clear that the group's position on the project was shared by the neighborhood. And the PDC pointed out that the project was designed to support a pre-existing set of local businesses that are housed in a former car dealership that was redeveloped with PDC support, to be exactly the kind of local business incubator that the opponents said is needed. See "Trader Joe's decision to pull out of NE Portland" and "Portland African American Leadership Forum says displacement, not Trader Joe's, focus of ire" from the Portland Oregonian and "What's Next For The Portland Development Commission?" from Oregon Public Broadcasting. Regardless of the specifics, most community groups and residents don't understand how development works: It's all about the money. 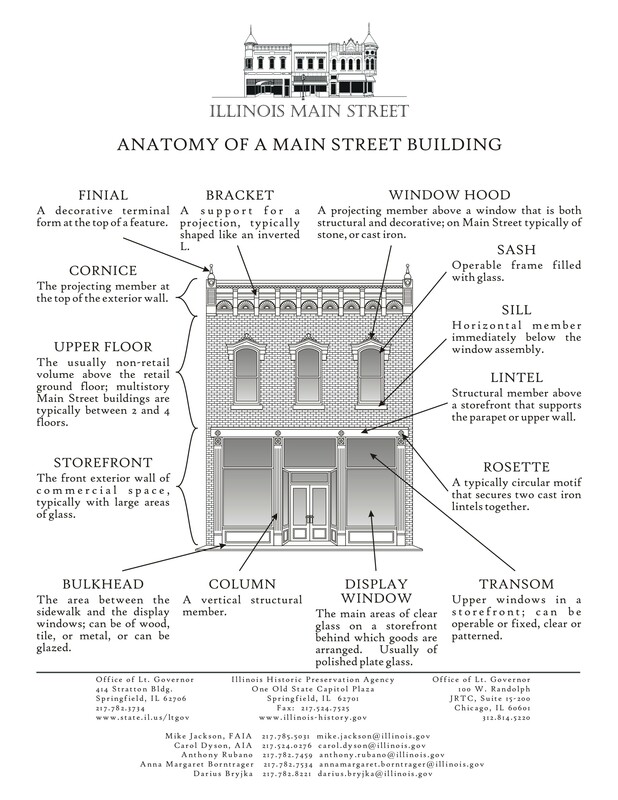 The ins and outs of financing real estate development and the economic elements of retail are complicated to begin with and are more complicated because most planners and community residents (and elected officials) don't fully understand the process. It's all about financing. And most financiers are leery about investing in places where there is any risk at all. Portland MAX Yellow Line (image credit: Dan Haneckow) from UrbanIndy. 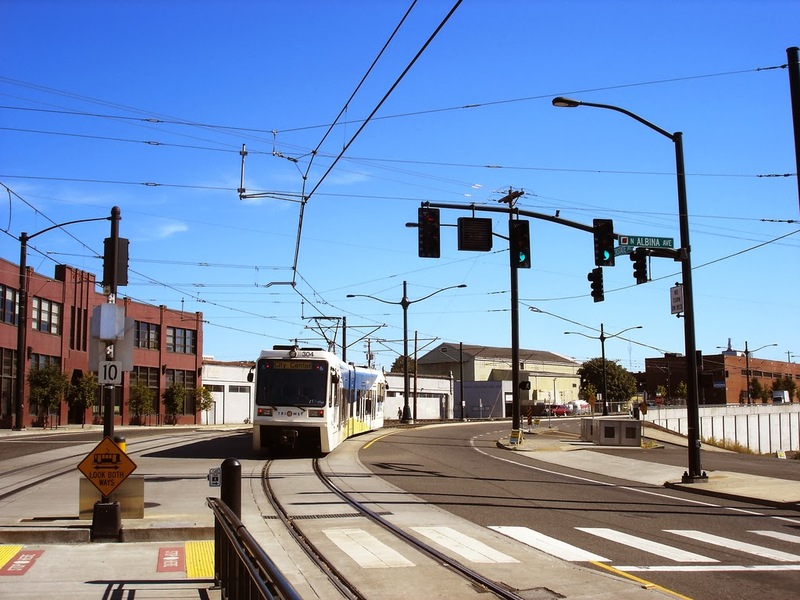 This light rail line was designed to spur revitalization in Northeast Portland, and was financed through the creation of an "urban renewal district" and the sale of bonds. Not understanding this impedes progress, especially in revitalizing areas, where the risk is higher and therefore it's much harder to raise money for construction. Often the intersection of a developer, a particular (hopefully good) project, and finance is ephemeral. If the circumstances change in the slightest, it's not uncommon for the project to implode. It's difficult to get projects off the ground in impoverished areas even in the best of circumstances. In areas where development is difficult, where the market needs subsidy, typically one way you provide subsidy is through free or low-priced land. It's even harder working in impoverished areas when the lead actors are small businesses with limited capacity and small developers with limited experience. The smallest hiccup can doom the project. That's why development agencies like the PDC or the Baltimore Development Corporation tend to be more comfortable working with larger organizations that have access to money and deeper track records. It does militate against small developers especially minority owned firms. 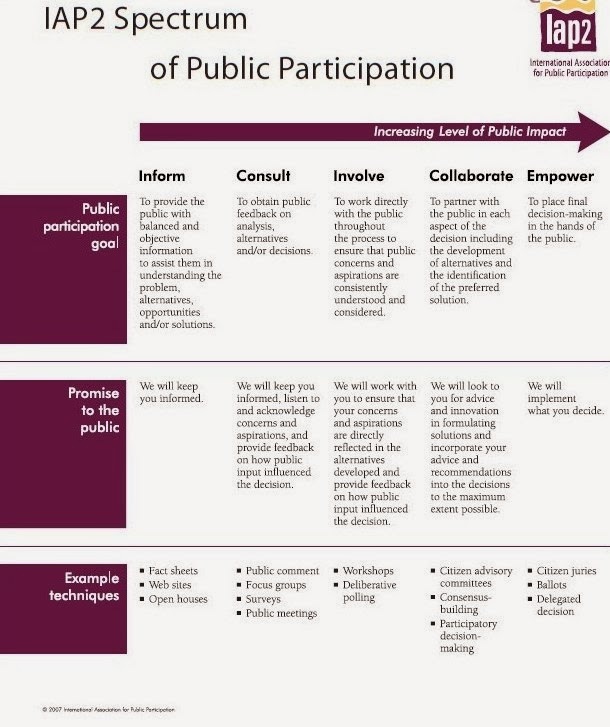 But typically (I don't know about PDC, but it's definitely the case with BDC) this isn't well explained and the planning processes can be very much top-down with limited community input, which creates a lot of agitation. Hence what happened in Portland. It's easy for potential tenants to walk away because they have minimal investment (sunk costs) in the project. It's harder for the developer if they have a lot invested. The reality is that the opposition by PAALF casts a shadow on the area for a long time to come. Given that there are better locations--defined as the opportunity for more profit and less risk--elsewhere in the city, this becomes one more reason to bypass this part of Northeast Portland. 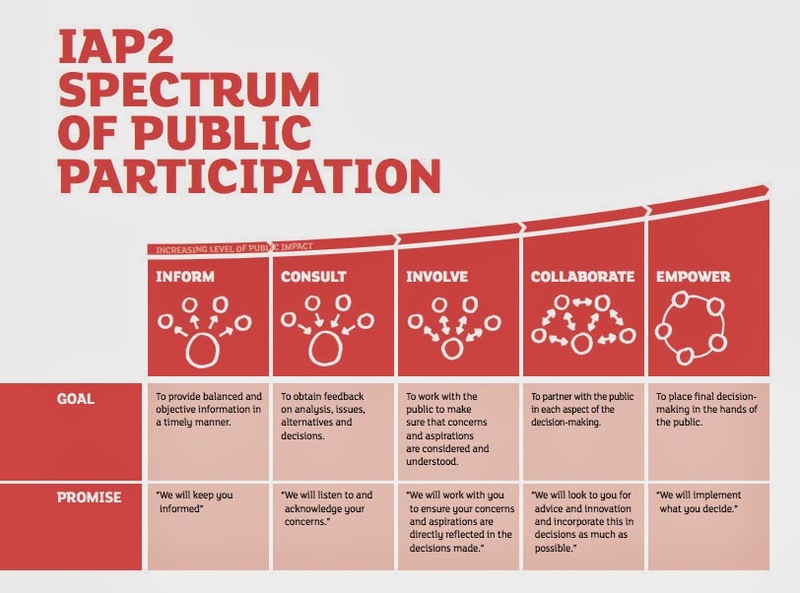 Complicated processes are no excuse for lack of public engagement. But if you want people to work together--at least somewhat--you need to let them be engaged in the process. And to satisfy the desires of the local community, you have to build processes so that capacity on the part of local developers and local businesses is strengthened through the projects you take on. This is another element of what I call the difference between "economic development" and "building a local economy." Update the revitalization plan. I don't know if there is a good revitalization plan for that area. I would expect that there is, as part of the process for planning and building the Yellow Line light rail. The acrimony expressed over this project at MLK Jr. Ave. and Alberta Street (the art walk at the Alberta Main Street is one of the coolest I've ever attended, but this intersection is a bit west of that district), is an indicator that an update and re-engagement process is necessary. The 10th anniversary of the Yellow Line is a good excuse for an update. Since it's been just about 10 years since the Yellow Line opened, it's a great time to launch a public process for updating the plan. To assess the progress, successes, mistakes and failures, and to acknowledge how the real estate recession (2008 to present) has affected opportunities, with a focus on doing better going forward. So it is fair to ding the PDC a bit, because clearly the process of how development works in weak markets is not well understood and they need to do a better job communicating, although I agree with the PDC director's point mentioned on the radio show, that you can't achieve absolutely every community objective within a single project--satisficing to get "everything" often means that many elements underachieve and this has negative consequences also. This was discussed on the radio program in terms of the expressed desire by PAALF for including "affordable housing" and the PDC director countered how at that particular site affordable housing is a lesser priority compared to (1) developing a highly visible site, (2) that has been vacant for more than ten years, (3) through the recruitment of a highly desirable anchor retail tenant, (4) whose presence can catalyze revitalization and private investment elsewhere in the corridor, (5) by bringing new attention to the inherent value of the area, (6) which is still underappreciated by developers and potential residents. Anacostia DC project. Similar to the situation in Portland, angst over development and redevelopment in DC's Anacostia has been happening for a long time. Opposition to streetcars has delayed investment in the system and the area for many years. More recently there have been concerns expressed about a preponderance of social service agencies being located in the commercial district, but at the same time the area is attracting new ventures ranging from the Anacostia Playhouse Theatre ("In Its New Home, the Anacostia Playhouse Finds a New Mission," Washington City Paper; "In Anacostia, new playhouse opens," Washington Post) to a restaurant venture that will also provide culinary training ("NURISH Food & Drink Opens Cafe in Historic Downtown Anacostia," press release). A couple days ago the Post ran a piece, "Debate over Anacostia houses focuses on preservation, commercial development," about a project on DC's Martin Luther King Jr. Avenue, where a community group would like to restore a fine, but vacant and dilapitated, Victorian house as a cafe. The "Big K" site is pictured above and below. 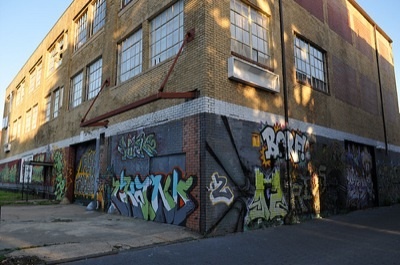 But the city has already chosen a developer that plans to redevelop the site as a mixed use project including housing. To do so, the developer will move the houses. The city argues the site is best used for a denser mixed use project, while residents express concerns about a failure "to preserve the historic character of the community." I'd argue this is another example of inadequacies in our planning processes. It's reasonable for the city to focus resources on redeveloping Martin Luther King as the commercial spine of Greater Anacostia. At the same time concerned residents have legitimate concerns about substantive change. On the other hand, people may argue that preserving "blight" without investing in the properties does no one any favors. Anacostia also demonstrates the need for revitalization processes to take the capacity building approach and engage citizens in the process as early as possible and as long as necessary, so that outcomes are better for everyone. In communities where people have a lot of experience being discriminated against, under-served and served poorly (cf. the findings within the Environmental Justice Movement as but one example of the kinds of mistreatment frequently experienced by minority and impoverished communities) it makes sense to expend extranormal resources on engaging and continuing to engage residents. Very good article Richard--please do a follow up. Tolls, parking taxes, elections, oh my!